A toluene-imprinted polymers (MIPs) homogeneous microsphere was prepared by precipitation polymerization technique using toluene as porogen (also as template) with 4-vinyl pyridine (4-VP) as the functional monomer. Structural characterization was performed by the nitrogen adsorption method and optical microscope utilized for observing particle size of polymers. Retention capability and selectivity for this MIP toward template vapor and its relative compounds were evaluated and the isotherm rebinding capacity of the MIP tested by adopting an inverse gas chromatography method. 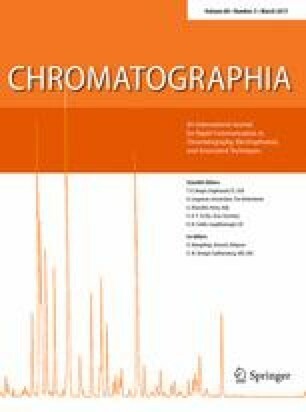 Results indicated that the toluene-imprinted polymer (MIP3), as a stationary phase in gas chromatography, possessed high retention selectivity toward template vapor, with a retention factor value of 68.42, an imprinting factor value of 7.049, and selectivity factor values of 4.821 and 5.370 for the template relative to benzene and p-xylene, respectively. A model mixture containing toluene, benzene, and p-xylene could be effectively separated, with a resolution of 5.138 for toluene to p-xylene and of 1.762 for toluene to benzene. The isotherm adsorption curve for the MIP3 toward toluene vapor exhibited II type of BET adsorption. Additionally, the toluene-imprinted microspheres showed satisfactory applicability in the removal of toluene from polluted indoor air. Financial supports from the National Science Funds of China (No. 21077042) and Research Project for postgraduates in Jishou University, Jishou, China (No. 15JDY008), China, and Aid program (Environment and Energy Materials and deep processing of mineral resources in Wuling Mountain) for Science and Technology Innovative Research Team in Higher Educational Institutions of Hunan Province are acknowledged.